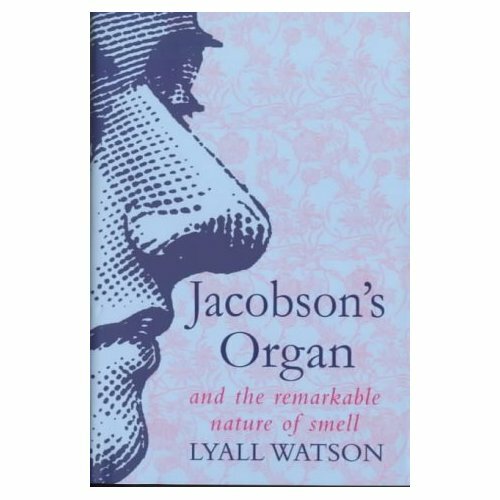 I’ve just finished a brilliant book – Jacobson’s Organ and the remarkable nature of smell by Lyall Watson. This has precisely nothing to do with sewing, fabric, craft, fashion, knitting or even cooking, all the usual subject matter of this blog. But I hope you will forgive me rambling about it, just because it is SO good. I do like non-fiction and find myself reading more and more of it. Travel writing, food writing, nature writing, design writing. All of these things. Nature writing does have a fair bit of science in it sometimes, but this book is the nearest I have got to reading about science in years. But it’s mostly about human (and animal and plant) behaviour and how our sense of smell, and the Jacobson’s organ which (they think) detects and processes pheromones, without us really knowing about it. Fascinating stuff. About how babies know the smell of their mothers, about how we sense where people have been and what they have been doing, about the smell of fear and of lust and of the unknown. And how we use perfume to enhance and distract. And how the sense of smell creates such strong emotional memories. I love the smell of sawdust and oil, metal and woodsmoke, all of which transport me to happy places. Finding this book was one of those serendipitous moments where you find something totally by chance that strikes a chord. Maybe I subconsciously picked up the scent of this book in a junk shop and was drawn to it. Whatever it was, I have thoroughly enjoyed it and heartily recommend it. For the last few weeks it has been my kitchen table reading, although there was a hiatus when it got moved, while i was reading the chapter about animals and poo. Couldn’t manage that over breakfast! Next on the kitchen table reading is Beechcombings, which I have been dipping into for months and haven’t got my nose stuck into yet. Hoping there is stuff in here about the scent of trees.